Check this blog every day to look for updates. This is the second load. The second load pick up is Tues May 3rd and May 4th. This is the schedule for picking up on Tues and Wed May 3rd and 4th. I have to spread out the pick ups through out the day. There are 400 beekeepers picking up and if everyone came at once, there would be a wait time of several hours. This way works well and I hope to be able to move folks through here with no longer than a 5 minute wait. The delivery date on the second load is going to be sooner than expected. I am trying to pin down the exact date and will update when I know. It looks like maybe Tuesday May 3rd or Wed May 4th delivery. 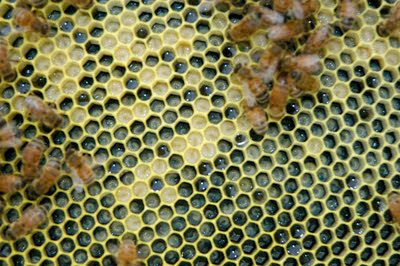 Various stages of brood from young to almost ready to cap. Eggs about a day old. Tough to see with the white on white contrast. Note the pollen stored above the brood and the nectar glistening in the cells above the pollen. The packages are in so now I am going to wait about 10 days to check for queen acceptance. This next check is the most important part to the success of the hive. 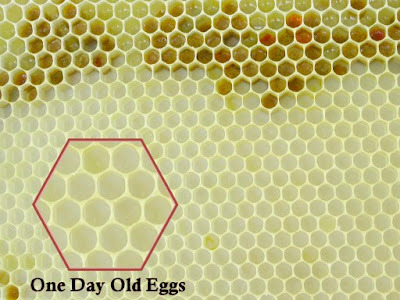 I will be looking for a nice frame of eggs laid by the queen. There should be a concentric pattern hitting most of the cells. If there is no eggs I will close it up and check again in four days. If I don't see them then it is time for a queen and the hive did not accept the first one. The bees are here. They are first come first served today. They are ready to go. Turn into this driveway marked with the sign to keep the traffic flow flowing the same way. Be careful on the road it does get busy. Here is a link to my website for a map to Nature's Nectar. click on the map, type in info for driving directions. I talked to Ray Olivarez today my supplier. The bees will be leaving Calif. tomorrow evening. I expect them sometime on Thurs. I will update with approximate time when I know it. The pick up schedule in the previous post will apply to Friday and Sat. 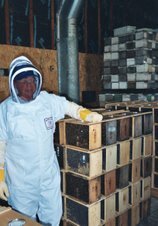 With Friday being Good Friday many beekeepers may be off their day jobs and I don't want to be swamped with 100 people at 11 am. This may cause a long wait and I try to get people out of here in about 5 minutes. Check this blog every day to look for updates. This is the first load. The second load pick up is May 7th. This is the schedule for picking up on Friday and Saturday April 23rd. I have to spread out the pick ups through out the day. There are 400 beekeepers picking up and if everyone came at once, there would be a wait time of several hours. This way works well and I hope to be able to move folks through here with no longer than a 5 minute wait. I talked to Ray from Olivarez Honey Bees tonight. He says they have been having excellent mating weather and the queens are looking great. They will be shaking packages daily for the next four weeks. The loads coming to Nature's Nectar will still be on the tentative dates first load April 23rd and the second on May 7th. They may come a little early so it is important to follow the blog to be current on updates. The mated queens availability will be catching up but unfortunately there are not many bee trucks for transporting packages. The delivery trucks will be running 24/7 for a month. The drivers are really going to earn their money. As I have said the two loads of are going to be two weeks late. I also have orders sitting here that I have not processed from up to two weeks ago. I should be done with them by Sunday. If you have sent me a bee order don't worry as I have included everyone in my package bee count. I have been watching the weather in Chico, California and they have been having very good queen mating weather. 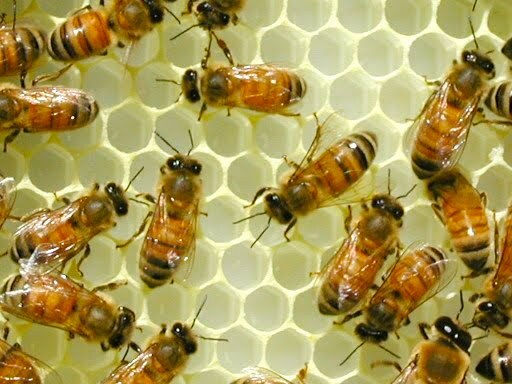 As of Tuesday April 5, I am sold out of package bees.